As Autumn moves in and the weather starts to cool and the rain returns in buckets! I have gathered my thoughts from the last number of months about golf courses played and the services provided. Therefore, it’s time to start Reviewing Irish Golf Courses played during 2018. The following opinion is mainly from my insights into golf, and my golfers feedback from the golf courses they played in 2018. Standing at the Stone of Accord at Old Head Golf Links looking back at the clubhouse. 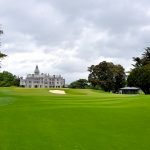 Adare Manor Resort played great. The forty green staff provides a golf course in pristine condition, and they work hard at keeping Adare the best-conditioned course in Ireland. Adare is by far the most impressive manicured golf course to play in Ireland. There is room to hit the ball around off the tee and the challenge to score is around the greens. The greens are mainly raised platforms with severe undulations to read. The bunkers are deep and very playable, and the green side run-offs are kept as good as most greens that we would play in any given year. The newly refurbished Resort Hotel is again the best property to visit in Ireland and not soft on the pocket. 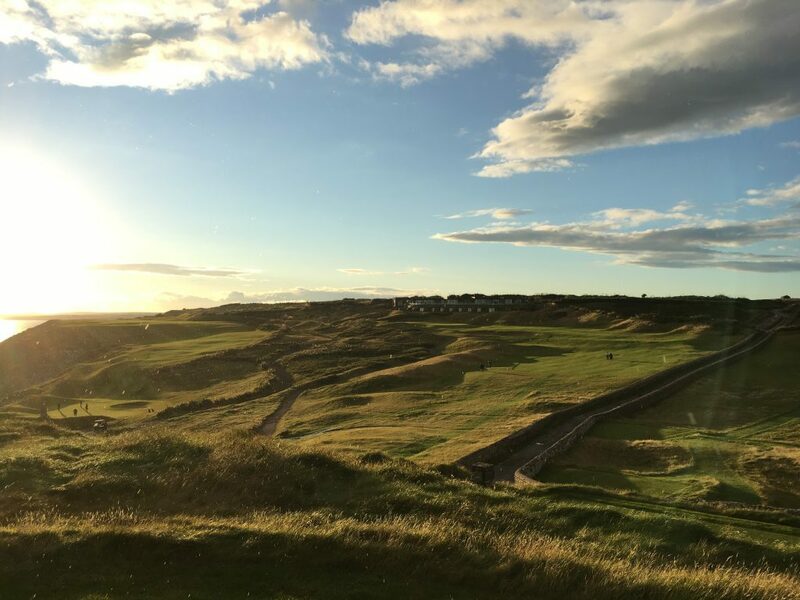 Ballybunion has undergone a whole host of recent upgrades and changes to the Old Course a few years ago. All eighteen greens were rebuilt, and a new fescue grass forms the bases for those greens. The drought affected the fairways that the club dramatically and the powers that be decided to overseed the fairways with a new grass to prepare for 2019. Thus, right now the fairways are bare in places the lies are quite tight, but playing from the fairways is not as bad as they look. However, that is my observations, and I would be keen to learn about your Ballybunion experiences from 2018. Difficult to hit shots off the hard fairways. Typically the clubhead bounces off the hard turf sending the golf ball off target. From the early part of the golfing season, the drought affected most of the links golf courses. Some courses let nature take it courses and others watered the course daily such as Doonbeg. 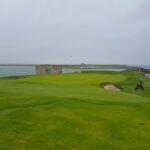 Golfers enjoyed playing Doonbeg this year more than previous years due to the quality of the fairways compared to other courses. 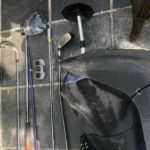 Perhaps, the dry weather caught some golf courses off guard, but it is my view that golf courses and operators should be able to deal with such problems. To the team at Old Head Golf Links, please take a bow for excellence. The set of the course, fairways, greens and tee boxes all played very well each time I played this year. The greens rolled smoothly, and it’s a toss-up between Adare & Old Head for the smoothest surface played. Also, my customer feedback noted that the Old Head’s is ranked number three from their caddie experiences. The caddie service was engaging with the golfers, friendly, funny jokes and offering sound advice. I am not surprised that all the tickets are sold out for the British Open Championship at Royal Port Rush Golf Club, 2019. The Open Championship is expected to be a great buzz and fantastic for the Portrush and surrounding areas. Please note that accommodation costs in those areas are higher due to that event. The club is doing what they can to ensure that the course will be in the best condition possible for the Championship next year. Such as, golfers must play off mats in May next year, and the course closes for play in June. Yes, indeed the course is indeed a great test of golf, thankfully there are not as many blind shots off the Tee comparing to Royal County Down. However, accuracy and hitting the ball into the right section of the green is the challenge at Portrush. The club caddies performed good, the information was good, and the caddies were very engaging. Certainly, golfers prefer the service from a single caddie rather than a double caddie. The main reason is the caddie service for just one person is better than a shared service. For example, looking for one golfer’s ball per hole and not two golfers at the same time! The caddie is providing golf shot information on demand rather than waiting for the other player to play, etc. I played nine holes recently in an unplayable storm force wind at Portmarnock. I was disappointed that the weather was for crazy golf and crazy for golfers to play. But there will be another time. However, I have played Portmarnock a number of times, and I did see a number of upgrades and changes. The Club has updated the course and did a lot of work on the bunkers, greens, tees and removed some of the scrubs in places. The work was undertaken to prepare for Royal and Ancient Amateur Championship to be hosted by Portmarnock Golf Club in 2019. The tee boxes and fairways were well defined. But, the fairway turf is hard and dry, notably, from tee shots, the ball will run more than you think. Therefore, leave more room to chip and run the ball off the greens. Also, be careful about aiming at the bunkers as the ball may run out into that bunker. The course played great, the green looked and rolled as expected fine until the wind blew the ball off the greens. For the time spent with the caddies, they were entertaining and provided good advice. I will update this review again in the coming months after another game at Portmarnock. Hogs Head is a new course build on the foundations of a course that was called Skellig Bay in the Waterville area in the South West of Ireland. I thought the new course was good fun to play and I am sure as the course matures there will be more improvements. Indeed, on the day that I played, the course was in good condition. Additionally, I enjoyed the course, it was cool, fun, lovely views and a challenging course to play. Whereas, Waterville is very close to Hogs Head and it is less than a 5-minute drive from door to door. It is worth noting that Hogs is an easier course to score on than Waterville Golf Links. Notably, I believe it is essential to describe the course as I see it. 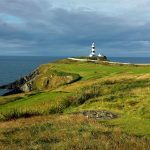 Hogs Head is not a representation of “The Irish Golfing experience” or a traditional Irish golf course, which is all fine, the golf course and facilities offer a different type of experience than mentioned. The golf course is kept in great shape, the Hotel and Lodges are at a 5* standard, and the customer is prompt. To summarise, I would suggest that the Hogs is for golfers that like luxury accommodation, prompt customer service, a playable course and not much pressure to play on time. 1885 was the year Royal Dublin Golf Club became affiliated an 18 hole golf course and the 2nd oldest club in Ireland. The course is located from 30 minutes from Dublin airport and 20 minutes from downtown Dublin City centre. Fairways are tight and golfers need to hit accurate tee shots to keep the ball on the short grass. The greens are slim and not that wide, whereas accurate approach shots are crucial. There are slopes to deal with around and on the greens. However, I found that there are all kinds of shots you can play from around the green. Such as the chip and run. Putter, chip shot, lop shot and any other shot you can think of. For some golf courses, I feel I need to write and write to explain my viewpoint. However, golf is easy to enjoy, hit the ball, find it and hit it again. Or as I coach the game, my taglines are “keep the game simple, but we need to work on some technical information to keep the game simple”. Also, click here to view historical stories about golf courses in Ireland. Please feel free to contact me about my views on Reviewing Irish Golf Courses. My contact info is located at CLICK HERE.